Results from the Nov. 6, 2018 election as of Friday, Nov. 16, 2018. From CCC Elections. Results from the November 6, 2018 General Election have been updated on the Contra Costa Elections website as of Friday, Nov. 16 at 2:07 P.M. You can view them here. A couple of points of interest: voter turnout is now at 62.2 percent for this election. Also, the Contra Costa Elections Division has processed nearly 2.3 million ballot cards to this point. Our next scheduled results update is at 5:00 pm on Wednesday, November 21st. In the Antioch School Board race, Ellie Householder expanded her lead over former Antioch Mayor Jim Davis to 1,399 votes, securing her victory along with Mary Rocha. 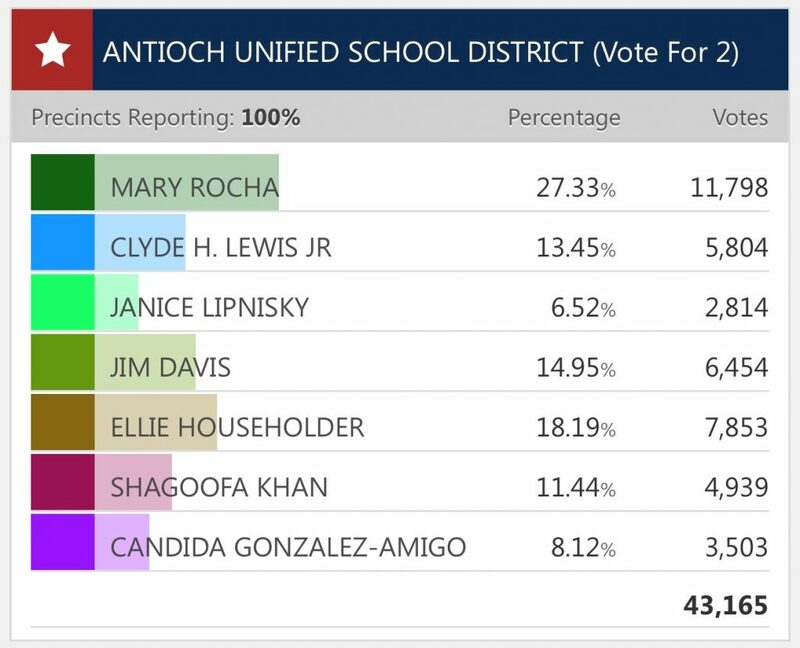 The former Antioch Mayor, Council Member and School Board Trustee, Rocha overwhelmingly took first place in the race, with 27.37% of the vote, so far and currently leads Householder by 3,945 votes. 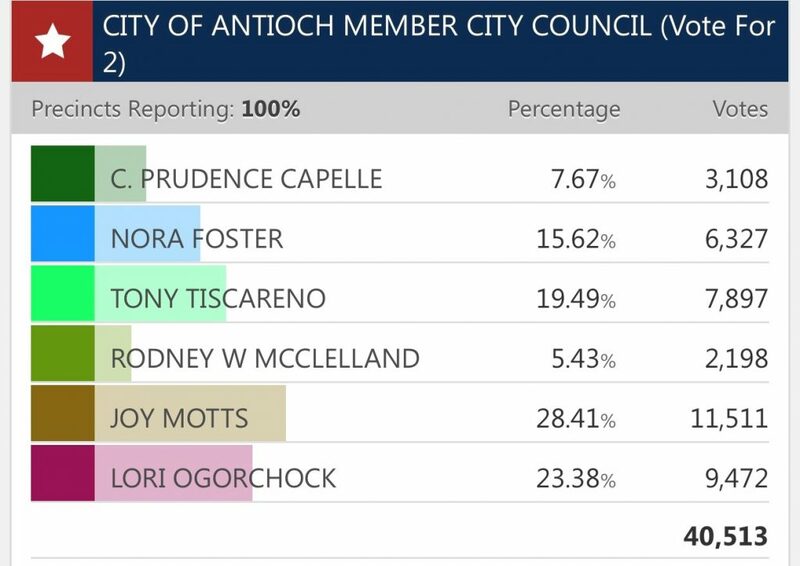 In the Antioch City Council race, Council Member Lori Ogorchock leads fellow Council Member Tony Tiscareno by 1,575 votes. She trails former Antioch School Board Trustee Joy Motts who finished first, by 2,039 votes. As a result, Motts will be the city’s next Mayor Pro Tem. Finally, the results for Antioch’s Measure W, which increased the city’s sales tax from a half- to one-percent, show it passing by 8,004 votes with 65.26% of the vote. That almost reaches the two-thirds requirement for a special tax to pass. Measure W is a general tax and only required a simple majority or 50% plus one vote to pass. This entry was posted on Saturday, November 17th, 2018 at 12:54 pm and is filed under News, Politics & Elections. You can follow any responses to this entry through the RSS 2.0 feed. You can leave a response, or trackback from your own site.